This recipe is very easy and fun to make. And it’s a kid friendly recipe. Try it. Crush the noodles into small pieces. 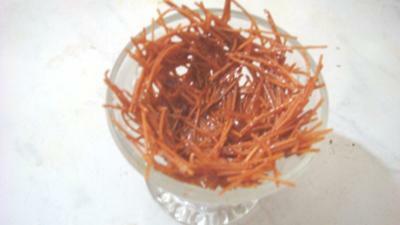 Roast noodles about two three minutes or until light golden brown (heat over medium heat). 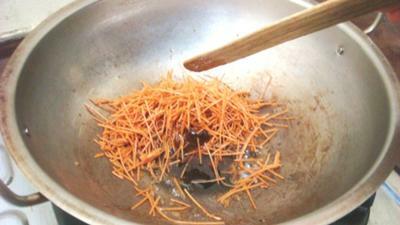 Stir continuously while roasting. Remove from heat and let cool. Then, in a thick-bottomed pan, add coconut pani or treacle (treacle is a coconut liquid, it’s brown in color and similar to molasses), sugar and cinnamon powder. Bring the mixture to a boil, up to 100 C degrees (use a candy thermometer if you have one). Then add the hot coconut mixture to the noodles and mix well. Place 4 tablespoons of the mixture into 4 greased (use butter if you can) ice cream cups. Press down the mixture firmly. I’ve done this in the photo above. Let the nests cool. 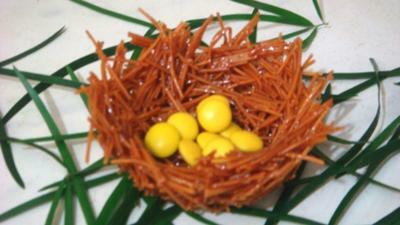 Remove from ice cream cups and place yellow candy in the center of the nests. Join in and write your own page! It's easy to do. How? Simply click here to return to Submit your kids recipe.